Annalea Beattie, a member of the Mars 160 Twin Desert-Arctic Analog simulation. We are well into phase one of our 160-day full space simulation here at the Mars Desert Research Station (MDRS) in the southeast Utah desert. I'd like to write to you about that word, "simulation." as it often seems to be misunderstood. Because of our firsthand experiences, my crew and I have a rare opportunity to share what a "simulation" actually means — for us, for our research and for the Mars 160 mission. Although nearly all of us here have spent time in a simulated space environment, one hundred and sixty days is a long time to be confined in a small space with the same group of people. This extended duration of the simulation is new for us all. Thankfully, the dehydrated diet is excellent and we are flourishing. In terms of how a simulation functions, this morning's science EVA (extravehicular activity) definitely provides some insight. Just moments ago, our team left the habitat ("hab" for short) on a science field trip to sample lichens. It took all of us several hours to carefully plan for the journey. After breakfast we were briefed by our commander to discuss the particular schedule, the designated times of egress and return, the specific roles for everyone — both here at the hab and in the field — and all the potential safety risks, including variables like the weather. Geologist Jon Clarke and biologist Anushree Srivastava being suited up by Yusuke Murakami and Crew Engineer Claude- Michel Laroche for a science EVA at the Mars Desert Research Station, Utah. Then there was a conversation with our mission scientists, where we revised the day's field science objectives. In this crew and on every crew that will travel into space, there are science generalists like me. As part of our simulation, and for us to fully support the field science goals of the mission, we are all in the process of cross-training. Early this morning we spent time preparing science equipment. This means tool bags, sampling equipment, notebooks, site maps and cameras. We assisted our crew engineer to check the suits, the fans, the battery charge of the tanks and all the communications. And it's better if you don't drink too much before you go, you know why. At the same time, we are not on Mars so we have to be reasonably hydrated to maintain our stamina in the field. Despite the fans in the helmets, at the moment it's hot outside and hot in those suits. All of the preparation for an EVA has to be perfect. It's awkward getting the suits on and off. We need help — they weigh 12.8 kilos with the helmet and we carry another three to four kilos, more with samples on the way home. Procedures are very strict when entering and leaving the hab and there is no ducking back inside if we have forgotten something. The crew spends five minutes in the airlock to allow for "de-pressurization," and "re-pressurization" takes a similar time. (Generally, in the lull between communications we try to pipe music into the airlock via the Hab-Com radio. Something space-like is the go- This morning, Jon Clarke sang the crew a couple of verses of an Australian ballad called "Clancy of the Overflow.") The crew members staying in the hab are all there to see the field team off, we wave goodbye and when they return, dinner is ready. As soon as we step outside the hab into the desert, our crew understands how wearing spacesuits and tanks seriously impacts mobility and, consequently, the science and engineering activities we're conducting in the field. Basic physical movement in the suits is difficult (for instance, in a spacesuit it's impossible to turn your head) and we have to learn quickly. On an EVA, to keep your crew in sight, you must walk side by side. And in the suits, you can't bend easily to pick up a stone or observe lichens. You have to squat down, otherwise you can topple over. In my case, everything falls out of my pockets onto the ground. Hmmm. Two members of the Mars 160 mission on an EVA. But there's more to a simulation on an analogue mission than spacesuits. A full simulation means that as the seven of us are isolated and confined in a barren, hostile environment in the middle of nowhere, our resources are set and limited. We have to work together to conserve what supplies we do have. As a crew, we monitor all food and measure water use daily. In terms of water, we shower once a week if we are lucky, we wash as much as we can in the vacuum washing cleaner and we minimize the amount of water we use to wash up and cook. If we can't sort out a problem or an issue ourselves, at the end of each day, our Capsule Communication Officer (CapCom), is there to help us with any issues or queries. For instance, the crew sends an EVA plan to CapCom as part of daily reports and CapCom reviews the safety measures of the EVA plan to make sure everything is in place. Daily, we send at least five reports to CapCom Mission Support, including information about science, engineering, food and daily pictures. The CapCom team are the principal point of contact between the crew and the mission specialists. They devote two hours of their lives everyday to check if are we doing well. Knowing that we are actually here on Earth at the Mars Desert Research Station, in the simulation we put safety first, and then real science in real places. In this context, to be successful is to stay true to the idea of our priorities. And everything we learn here builds to assist us when we get to the second phase of our twin mission, at Flashline Mars in the Arctic Circle next year (though I will probably have to get some extra gun training back in Australia for polar bears!). Part of being able to fulfill the science expectations on a full simulation EVA is a shared knowledge of potential difficulties and hazards. Adapting to air tanks and space suits in an extreme environment like the Utah desert also means adapting science techniques to find new strategies. For example, if we think about geology, a standard field test for a geologist is to spit or pour a bit of water on a rock. This moistens the surface, as sometimes layering and detail is more visible when a rock is wet. On Mars there will be no outside water use for geology. Water will boil away, evaporate or freeze. 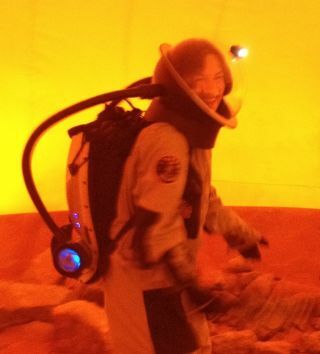 Annalea Beattie of the Mars 160 Twin Desert-Arctic Analog mission, during an EVA in Utah. And there will be no spitting. Australian geologist Jon Clarke says a scientific study of Mars analogues under conditions of full simulation enables us to quantify constraints and involves a test program that endeavours to replicate, as completely as practicable, the operational limitations of a Mars surface mission. This includes communication, scheduling, food restrictions, safety procedures, equipment, including the suits and vehicles, living arrangements and duration. Jon has been here to MDRS three times as part of Crew 11 in 2003, Crew 92 in 2010 and Crew 104 in 2011. His first crew underwent a four week mission that built towards a full simulation in phases, culminating in an integrated simulation that included the habitat, suits, ATVs, and pressurized rovers with away teams departing on missions away from the hab that were 2-3 days in duration. In 2010, on Crew 92, MDRS was used as a field station. But in the last week of the mission, a simulated EVA was carried out with two people successfully testing a drilling program with a crew portable diamond drill. In 2011, suits were not used, but the Honeybee Robotics-developed robotic MARTE drill was operated in the field and its performance compared with a crew- operated drill. "For me, as a girl who dreamed to become [a] cosmonaut since I was a kid, a full simulation means a chance to actually check my guts. Many people think they would love to go to Mars, but when they get into the situation, close to their desire, they realize that their execution expectation and the reality are quite different."' For Anastasiya, a full simulation provides an opportunity to test her abilities, to learn about herself and grow as a human. Our Crew Engineer Claude-Michel Laroche suggests that a good simulation needs to be asynchronous, in that nothing has direct feedback and it's about sticking to regulations. To Claude, safety should always come before the simulation. Anushree Srivastava and Jon Clarke wait in the Decompression Room as part of the Mars 160 mission. Crew Commander Alex Mangeot claims simulation should involve the best hardware possible in order to make the experience of Mars on Earth more realistic in terms of technology. His own space suit research aims to improve the hardware that surrounds us; in this case, the interface between the person, the habitat, the EVA and the spacesuit itself. XO Yusuke Murakami is an architect who works on habitats in extreme environments, particularly in Antarctica. He has also worked in Nepal, where his shelters were used to aid earthquake victims. Yusuke suggests that the simulation enables creative design, in that it allows him to understand the value of human--centred measurements for living in space. His research on this mission is to explore architecture for life in space that relies neither on pure function nor pure aesthetics. Yusuke's previous experiences of isolated and confined environments have been with a Japanese crew on an expedition in Antarctica. His greatest challenge, he says, is to collaborate in simulation with an international crew. As an artist, my research in geological field sketching reinforces the value of observational data in understanding emerging geology and biology in extreme settings. Drawing in the field involves geological sketching of the site and the investigation within EVA time constraints. Off-Earth, geologists will have to observe, document and relay multiple hypotheses to Earth through imagery, as well as verbally. As well as site documentation, context provided through observation is vital to meaningful sample interpretation. Field drawing combined with note-taking develops expertise as a critical skill set for planetary field science. A successful simulation for me means I have to think carefully about addressing methodologies for adapting existing field sketching skills to the analogue Martian environment. My aim is to improve how we best gather data, as well as build the experience of the explorer/researcher and extend drawing tools, methods, resources and protocols within the simulation. I've only just begun to really test out my own drawing skills in the spacesuit. Will this really work? I'll let you know how it goes. Our crew has arrived home from their field trip and are decompressing in the airlock. Our mission is Anushree's first experience in a simulated Mars-like environment and so this has been her first experience of sampling in a spacesuit. Now we have the new suits from North California Mars Society, (thank you, wonderful people from North Cal!). Anushree says the experience of science in simulation is quite special and something that not everyone has the opportunity to do. "Physically you feel like you are in another world doing something unearthly, in this case collecting lichen samples. The suit is not convenient and it really makes you realise where you are and that the hab is there as your home. At one point when you start feeling exhausted, your shoulders ache with the heavy tank, you feel extremely thirsty and sweaty and you tell yourself — do it anyway. This is for all the challenges you went through before coming to do this special job! This is your opportunity for the sake of science and space exploration." At the end of time here, Anushree will return to MDRS a second time, to gain further experience as part of Crew 172. Here in the loft at the Mars Desert Research Station, a ray of sunlight creeps in through the tiniest chink in the roof and plays across the floor. Since our simulation began, I've begun noticing the flying ants and small spiders who share the hab with us. On to Mars ants and spiders! Editor's note: To follow The Mars Society's Mars 160 mission and see daily photos andupdates, visit the mission's website here: http://mars160.marssociety.org/. You can also follow the mission on Twitter @MDRSUpdates.